Seajacks was the main installation contractor for the construction of Meerwind, a 288MW wind farm development located in the Exclusive Economic Zone region of the German North Sea. When fully operational, the eighty turbine project will produce enough energy to power 400,000 households every year. This, in turn, will eliminate 1 million tonnes of carbon emissions per year. Seajacks Leviathan and Seajacks Zaratan worked in tandem to install all foundation and WTG components. 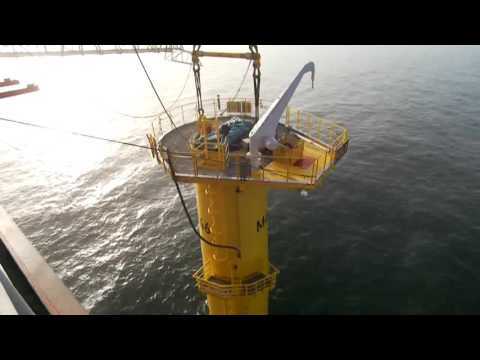 A video highlighting the key points of the Meerwind installation is available below. Seajacks tendered, procured and managed the Scour Protection which is designed to defend the monopiles against hydrodynamic erosion. The rock material was laid in 2 stages: the filter layer was deployed subsea prior to the monopile installation and the armour layer, was laid via an innovative new tool for deployment of large rock over the side of a vessel, following the installation of the foundations. The Zaratan implanted each monopile using a S-2000 Hydro Hammer, driving each monopile 26m into the sea bed. The 5.5m diameter monopiles were upto 60m long and 670t. During installation a noise mitigation system was deployed to reduce the noise levels during hammering which could effect the marine mammals. A third part vessel was contracted to deploy a double big bubble curtain, which surrounded the Seajacks Zaratan prior to the monopile installation. The majority of the 80 transition pieces were installed by the Leviathan, which was modified for the project with a new crane, a 400T Kenz model. The new crane is capable of lifting 400t at 18.5m and is complemented by the installation of two new Palfinger auxiliary cranes to increase the efficiency of handling small loads on and around deck. The TPs were lifted on to the monopile using the main crane, levelled, then grouted according to the German authority requirements. Seajacks Zaratan loaded the Siemens 3.6MW turbines from the port in Esbjerg, Denmark. Seajacks Zaratan is ideal for the work, since she has the capacity to transport 5 turbines per cycle. The Seajacks team take pride in their record of producing safe, fast and efficient loading of turbine components. Seajacks Zaratan managed to load, transport and install 3 monopiles in a staggering 36 hours. The installation of the last turbine at this demanding German location signified a tremendous achievement by Seajacks’ construction team and vessel crews; the experience at Meerwind will provide Seajacks with vital experience for future projects which will be even more technically challenging.